[2019-01] Dr. Xinpei Yi joined the lab as a postdoctoral research fellow. Xinpei just graduated from the Institute of Applied Mathematics, Chinese Academy of Sciences, Beijing, with a PhD degree in Probability Theory and Mathematical Statistics and Bioinformatics. Welcome, Xinpei! [2019-01] Bo’s paper PepQuery enables fast, accurate, and convenient proteomic validation of novel genomic alterations has been published in Genome Research. Congratulations, Bo! PepQuery is a peptide-centric search engine that allows quick and easy proteomic validation of genomic alterations without customized database construction. Next generation sequencing-based genomic studies continuously identify new genomic alterations that may lead to novel protein sequences, which are attractive candidates for disease biomarkers and therapeutic targets after proteomic validation. The popular approach for proteomic validation requires customized database construction and a full evaluation of all possible spectrum-peptide pairs, which is time-consuming. We implemented PepQuery as both stand-alone and web-based applications. The stand-alone version supports batch analysis and user-provided MS/MS data. The web version provides access to more than half a billion MS/MS spectra from the Clinical Proteomic Tumor Analysis Consortium (CPTAC) and other cancer proteomic studies, making MS/MS data directly available and useful to scientists outside the proteomics community. PepQuery can be accessed at http://www.pepquery.org. [2019-01] Dr. Jonathan Lei joined the lab as a postdoctoral research fellow supported by the Breast Center T32 training program. Jonathan just got his PhD in Translational Biology & Molecular Medicine from BCM. Welcome, Jonathan! [2019-01] Ahmed Gad from TBMM interdisciplinary program joined the lab for a research rotation. Welcome, Ahmed! [2019-01] Jiasheng Wang from the QCB program joined the group for a research rotation. Welcome, Jiasheng! [2018-12] Kai Li joined the lab as a bioinformatics programmer. Welcome, Kai! [2018-10] Wen Jiang (Faye) from the QCB program joined the group for a research rotation. Welcome, Faye! [2018-09] Bo’s paper PDV: an integrative proteomics data viewer has been published in Bioinformatics. Congratulations, Bo! PDV is a lightweight visualization tool that enables intuitive and fast exploration of diverse, large-scale proteomics datasets on standard desktop computers in both graphical user interface and command line modes.The software and the user manual are freely available at http://pdv.zhang-lab.org . The source code is available at https://github.com/wenbostar/PDV. [2018-07] Congratulations to Sara on successfully defending her Master’s thesis! [2018-05] Four students joined the group for summer research experience. Damilola Omotajo is an incoming graduate student in the MHG program; she has a B.S. degree in Mathematics with Minor in Biology and an M.S. degree in Biology with Minor in Statistical Methods from the Sam Houston State University.Paul Jiang, a rising junior at the Rice University pursuing a degree in Computer Science, joined the group as a Research Observer. Both Aaron Westbrook and Kailey Ferger are supported by the SMART program. Aaron just graduated from the University of St. Thomas with a B.S. degree in Bioinformatics, and this is his second summer in our group. Kailey is a rising senior at the University of Rochester pursuing a degree in Computational Biology. Welcome our new members! [2018-02] Mr. Ram Srinivasan joined the group as a Senior Bioinformatics Programmer. Ram received his B.S. degree in Bioinformatics from the SASTRA University in India and M.S. degree in Bioinformatics from the NYU Polytechnic School of Engineering. He worked at the Icahn School of Medicine at Mount Sinai for three years before joining our lab. Welcome, Ram! [2018-02] Dr. Yuxing Liao joined the group as a Programmer/Analyst II. Yuxing received his B.S. degree in Biological Science from the University of Science and Technology in China and just completed his Ph.D. study on Molecular Biophysics with Computational and Systems Biology specialty at the University of Texas Southwestern Medical Center. Welcome, Yuxing! [2018-02] Mr. Noel Namai joined the group as a Programmer/Analyst I. Noel received his M.S. degree in Bioinformatics from the Northeastern University and B.S. degree in Mathematics from the Maseno University in Kenya. He worked at the Seven Bridges Genomics for two years before joining us. Welcome, Noel! [2018-01] Mr. Leo Zhang joined the group as a Research Technician. Leo received his B.S. degree in Biological Science from the Colorado State University with a Minor in Mathematics. Welcome, Leo! [2017-12] Xiaojing’s paper Detection of proteome diversity resulted from alternative splicing is limited by trypsin cleavage specificity. has been published in Molecular & Cellular Proteomics. Congratulations, Xiao Jing! Alternative splicing dramatically increases transcriptome complexity but its contribution to proteome diversity remains controversial. Exon-exon junction spanning peptides provide direct evidence for the translation of specific splice isoforms and are critical for delineating protein isoform complexity. In this paper, we studied the proteomic coverage of exon-exon junctions in three publicly available proteomics data sets and found that trypsin preferentially cleaves exon-exon junctions and thus hinders the detection of junction-spanning peptides. This phenomenon was explained by evolutionarily conserved preferential nucleotide usage at exon boundaries according to nucleotide sequence analysis of five eukaryotic genomes. Our in silico and experimental analyses showed that complementary digestion schemes are essential to study the translation of alternative mRNA splicing to proteome diversity. [2017-11] Dr. Eric Jaehnig joined the group as a Research Associate. Eric received his Ph.D. degree in Biology from the University of California, San Francisco, followed by postdoctoral training in systems biology at the Ludwig Institute for Cancer Research. To enhance his quantitative skills, Eric recently completed a Master’s degree in Bioengineering from the Rice University. Welcome, Eric! [2017-11] Suhas’ paper LinkedOmics: analyzing multi-omics data within and across 32 cancer types has been published in Nucleic Acids Research. LinkedOmics is a new and unique resource for disseminating and analyzing The Cancer Genome Atlas (TCGA) data. It is also the first multi-omics database that integrates mass spectrometry (MS)-based global proteomics data generated by the Clinical Proteomic Tumor Analysis Consortium (CPTAC) on selected TCGA tumor samples. LinkedOmics has three analysis modules. The LinkFinder module allows flexible exploration of associations between a molecular or clinical attribute of interest and all other attributes, providing the opportunity to analyze and visualize associations between billions of attribute pairs for each cancer cohort. The LinkCompare module enables easy comparison of the associations identified by LinkFinder, which is particularly useful in multi-omics and pan-cancer analyses. The LinkInterpreter module transforms identified associations into biological understanding through pathway and network analysis. In this paper, we used five case studies to demonstrate that LinkedOmics provides a unique platform for biologists and clinicians to access, analyze and compare cancer multi-omics data within and across tumor types. 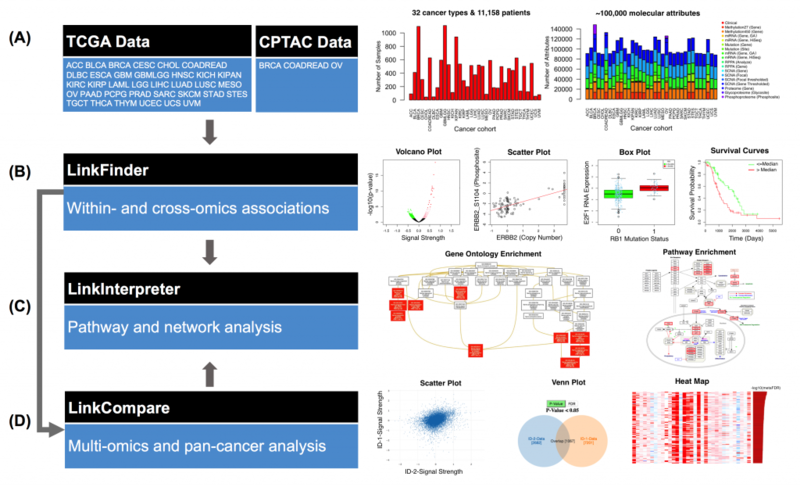 Although the current version of LinkedOmics includes only TCGA and CPTAC data, it can be easily extended to support other cohort-based multi-omics studies. [2017-10] Dr. Hyokyeong Lee joined the group as a Research Associate. Hyokyeong received her Ph.D. degree in Computer Science from the University of Southern California and was a Postdoctoral Associate in the Department of Computational and Systems Biology at University of Pittsburgh. Welcome to the lab, HyoKyeong! [2017-10] Chaohao Gu from the SCBMB program joined the group for a research rotation. Welcome, Chaohao! [2017-08] PepQuery, a peptide-centric search engine for novel peptide identification and validation, is now online. [2017-08] Jingyuan Hu from the SCBMB program joined the group for a research rotation. Welcome, Jingyuan! [2017-07] Charindu Ranmuthu, a rising junior from the Queens’ College, Cambridge joined the group for a summer internship. Welcome, Cha! [2017-06] Our collaborative study with Drs. Sieber, Liebler, Burgess, Chen and their group members on the integrative proteogenomic analysis of colorectal cancer cell lines and human tumors has been published in Gastroenterology in a paper entitled Colorectal cancer cell line proteomes are representative of primary tumors and predict drug sensitivity. [2017-05] Aaron Westbrook, a rising senior at the University of St. Thomas in Houston joined the group for a summer internship through the SMART program. Welcome, Aaron! [2017-05] Jing’s paper WebGestalt 2017: a more comprehensive, powerful, flexible and interactive gene set enrichment analysis toolkit has been published in Nucleic Acids Research. 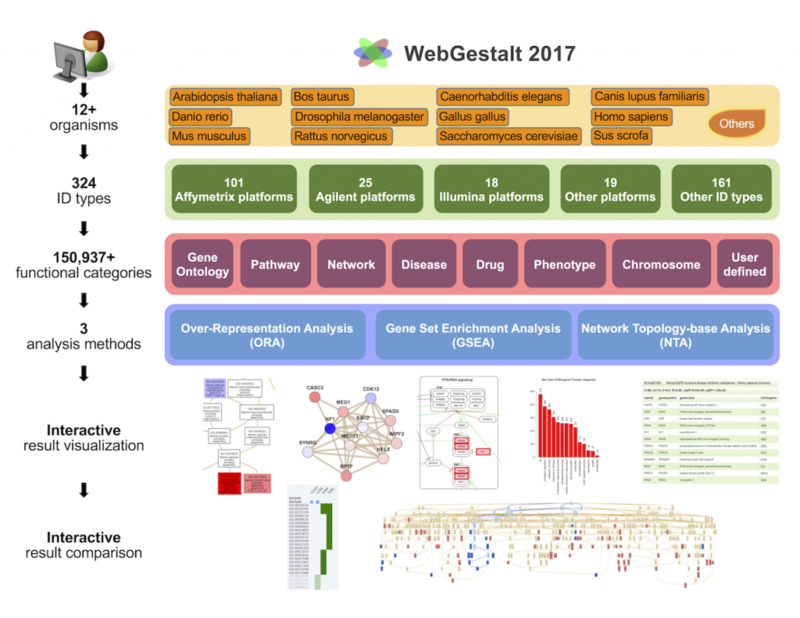 The WebGestalt 2017 knowledge base supports 12 organisms, 324 gene identifiers from various databases and technology platforms, and 150,937 functional categories from public databases and computational analyses. Importantly, omics data with gene identifiers not supported by WebGestalt and functional categories not included in the WebGestalt database can also be uploaded for enrichment analysis. The analysis module supports Over-Representation Analysis, Gene Set Enrichment Analysis, and Network Topology-based Analysis. The input interface is simplified, the output interface allows interactive and efficient exploration, and the complete set of results can be easily downloaded. The new GOView tool makes it easy to compare multiple sets of GO enrichment results in the context of the GO directed acyclic graph (DAG). [2017-02] Dr. Chen Huang joined the group as a Postdoctoral Research Fellow. Chen just received his Ph.D. degree in Biomedical Science from the Vanderbilt University earlier this month. Welcome to the lab, Chen! [2017-02] Mr. Bo Wen joined the group as a Bioinformatics Programmer. Bo received his Bachelor’s degree in Bioinformation Technology from the Huazhong University of Science and Technology in China in 2010. After graduation, he has been working in the Proteomics Research Group at the BGI-Shenzhen, where he has developed and published multiple bioinformatics tools for proteomics and proteogenomics. Welcome, Bo! [2016-11] Yongchao’s paper Circular RNAs are down-regulated in KRAS mutant colon cancer cells and can be transferred to exosomes has been published in Scientific Reports. Congratulations, Yongchao! [2016-11] From GenomeWeb.com: Proteomic Data Improves Gene Function Predictions, CPTAC Team Finds. [2016-11] Jing’s paper Proteome profiling outperforms transcriptome profiling for co-expression based gene function prediction has been published in Molecular & Cellular Proteomics. Congratulations, Jing! [2016-11] Zhang Lab welcomes visiting scholar Professor Sang-Won Lee from the Korea University and his student Jeong Eun So (Jessie). Sang-Won and Jessie will be staying with us until January 2017. [2016-08] Zhang Lab has moved from VUMC to BCM. [2016-07] Congratulations to Matt on successfully defending his Master’s thesis! [2016-06] Congratulations to Jason on successfully defending his Master’s thesis! [2015-12] Qi’s paper Integrative omics analysis reveals post-transcriptionally enhanced protective host response in colorectal cancers with microsatellite instability has been published in the Journal of Proteome Research. The paper introduces a resampling-based regression method that integrates transcriptomic and proteomic datasets to accurately identify genes subject to differential post-transcriptional regulation. Applying the method to the TCGA colorectal tumors revealed post-transcriptionally innitiated protective host response in cancers with microsatellite instability. [2015-12] Xiaojing’s paper proBAMsuite, a bioinformatics framework for genome-based representation and analysis of proteomics data has been published in Molecular & Cellular Proteomics(MCP). This paper introduces protein BAM (proBAM), a new file format for organizing peptide spectrum matches (PSMs) within the context of the genome. The proBAMsuite includes two R packages, proBAMr and proBAMtools, for generating and analyzing proBAM files, respectively. The study demonstrated the utility of the proBAMsuite in facilitating efficient genome-based sharing, interpretation and integration of proteomics and proteogenomics data. [2015-12] Matt received the 2015 DBMI Research Staff Excellence Award. Congratulations! [2015-12] Junhui Shen M.S. joined the group as a visiting scholar. Junhui is an Associate Professor at the Information Center of the Beijing University of Chinese Medicine. Welcome to the group! [2015-10] QCB student Mary Benton joined the group for a research rotation. Welcome, Mary! [2015-08] MSTP student Patrick Wu joined the group for a research rotation. Welcome, Patrick! [2015-07] Our old friend Matt Chambers becomes a new member in the Zhang Lab. Welcome, Matt! [2015-06] Zhang Lab welcomes four new members, including Suhas Vasaikar, a Postdoctoral Research Fellow from Karolinska Institute; David Ma, a recent college graduate from Washington University in St. Louis; and two summer intern students, Kofi Amoah from Fisk University and Daniel Hong from Martin Luther King Magnet. [2015-04] Dr. Zhang is a recipient of the 2015 CQS High Impact Award for the article, “Proteogenomic characterization of human colon and rectal cancer” [Zhang, et al. (2014) Nature, 513, 382-387]. [2015-03] IGP student Romell Gletten joined our group for a research rotation. Welcome, Romell! [2015-01] Dr. Zhang is a recipient of the 2015 VICB Highly-Cited Article Award for the article, “Protein identification using customized protein sequence databases derived from RNA-Seq data” [Xiaojing Wang, et al. (2012) J. Proteome Res., 11, 1009-1017]. [2014-12] Jing’s paper Empowering biologists with multi-omics data: colorectal cancer as a paradigm has been published in Bioinformatics. In this article, we describe the application of the NetGestalt framework to provide a network-centric view of multidimensional cancer omics data, using colorectal cancer (CRC) as an example. The NetGestalt CRC portal is publicly available at the NetGestalt website. [2014-11] We have a new opening for an Application Developer position. Please check the Positions page for more information. [2014-10] Our collaborative study with Dr. Beauchamp’s group leading to the discovery of NFATc1 as an invasive driver in colon cancer has been published in Cancer Research in a paper entitled Nuclear factor of activated T-cell activity is associated with metastatic capacity in colon cancer. [2014-10] Our review article Leveraging the complementary nature of RNA-Seq and shotgun proteomics data has been published in Proteomics. Congratulations, Xiaojing and Qi! [2014-09] Dr. Zhang received the 2014 DBMI Outstanding Educator Award. [2014-08] DBMI postdoctoral trainee Jason Castellanos, MD, joined our group for a research rotation this Fall. Welcome, Jason! [2014-08] QCB student Michael Greer joined our group for a research rotation. Welcome, Michael! [2014-08] Peter has created eight excellent tutorial videos for NetGestalt. They are available from the NetGestalt homepage. Try the “What is NetGestalt” video now! [2014-07] Xiaojing received the best poster award from the 3rd Mass Spectrometry Special Interest Group (MS-SIG) meeting at ISMB 2014, Boston. Congratulations, Xiaojing! [2014-07] The paper Proteogenomic characterization of human colon and rectal cancer is now online in Nature. Congratulations to all lab members who participated in this study and our collaborators! [2014-07] Dr. Yongchao Dou joined the group as a Postdoctoral Research Fellow. Welcome to the group! [2014-07] Mr. Peter Straub joined the group as a Bioinformatics Systems Engineer. Welcome to the group! [2014-07] Dr. Xiaojing Wang has been promoted to Research Instructor of Biomedical Informatics effective July 1, 2014. Congratulations, Xiaojing! [2014-05] Xiaojing’s review article Integrating genomic, transcriptomic and interactome data to improve peptide and protein identification in shotgun proteomics has been published in Journal of Proteome Research. Congratulations! [2014-05] Congratulations to Jing (co-first author) and our wet-lab collaborators at the Vanderbilt Conte Center on the paper An open-source analytical platform for analysis of C. elegans swimming induced paralysis published in the Journal of Neuroscience Methods. The paper describes SwimR, an R-based suite that calculates, analyzes, and plots the frequency of C. elegans swimming behavior over time. It places a particular emphasis on identifying paralysis and quantifying the kinetic elements of paralysis during swimming. SwimR is available at Bioconductor. [2014-03] IGP student Michael Bray will be doing a research rotation in our group. Welcome! [2013-11] Jing’s paper Deciphering genomic alterations in colorectal cancer through transcriptional subtype-based network analysis has been published in PLoS One. This work demonstrated that integrating transcriptional subtype and signaling network analyses can help reveal subtype-specific signaling network alterations and provide insights into the development of personalized therapeutic strategies. Congratulations, Jing! [2013-11] Congratulations to XiaoJing (co-first author) and our wet-lab collaborators at the Jim Ayers Institute for Precancer Detection and Diagnosis on the Cancer Research paper Proteogenomic analysis reveals unanticipated adaptations of colorectal tumor cells to deficiencies in DNA mismatch repair. [2013-10] Jing received the 2013 DBMI Research Staff Excellence Award. Congratulations! [2013-09] Xiaojing’s paper customProDB: an R package to generate customized protein databases from RNA-Seq data for proteomics search has been published in Bioinformatics. Congratulations, Xiaojing! [2013-09] Qi’s paper RNA-seq data analysis at the gene and CDS levels provides a comprehensive view of transcriptome responses induced by 4-hydroxynonenal has been published inMolecular BioSystems. Congratulations, Qi! [2013-08] Congratulations to Jing and our wet-lab collaborators in the Massion Lab on the Clinical Cancer Research paper “Integrative genomics analysis identifies candidate drivers at 3q26-29 amplicon in squamous cell carcinoma of the lung“. Using an integrative computational analysis followed by experimental validation, the study identifed three candidate driver genes (SENP2, DCUN1D1 and DVL3) that could potentially stratify patients with lung squamous cell carcinoma into subgroups with different response to adjuvant chemotherapy. [2013-07] NetGestalt was highlighted in the VUMC news. [2013-06] NetGestalt has been published in Nature Methods. NetGestalt is a novel data integration framework that allows simultaneous presentation of large-scale experimental and annotation data from many sources in the context of biological networks to facilitate data visualization, analysis, interpretation and hypothesis generation. Congratulations, Zhiao and Jing! [2013-06] In an interview with the eProtein newsletter of NCI, Dr. Zhang expressed his view on proteogenomic data integration. [2013-05] Two undergraduate students joined the group through the DBMI summer internship program. Liron Ganel is a rising senior majoring in Biochemistry, Computer Science, and Mathematics at the Indiana University, Bloomington. Derek Shyr is a returning summer intern from the Washington University in St. Louis. Welcome both Liron and Derek! [2013-05] Congratulations to Jing on the new Nucleid Acids Research paper WEB-based GEne SeT AnaLysis Toolkit (WebGestalt): update 2013. This is an update from a previous publication on WebGestalt in the same journal in 2005. For the last 7 years, WebGestalt data holdings have grown substantially to satisfy the requirements of users from different research areas. The current version of WebGestalt supports 8 organisms and 201 gene identifiers from various databases and different technology platforms. Meanwhile, by integrating functional categories derived from centrally and publicly curated databases as well as computational analyses, WebGestalt has significantly increased the coverage of functional categories in various biological contexts including Gene Ontology, pathway, network module, gene–phenotype association, gene–disease association, gene–drug association and chromosomal location, leading to a total of 78,612 functional categories. Finally, new interactive features, such as pathway map, hierarchical network visualization and phenotype ontology visualization have been added to WebGestalt to help users better understand the enrichment results. WebGestalt can be freely accessed through http://www.webgestalt.org or http://bioinfo.vanderbilt.edu/webgestalt/ . [2013-04] Dr. Zhang has received a three-year contract award from the SAIC Frederick, Inc. This contract award will support the continuous development of NetGestalt, a web application for integrating multidimensional omic data over biological networks. NetGestalt will be used to build a cancer omics data browser for data generated from the NCI TCGA and CPTAC projects. [2013-04] Qi’s MCP paper was highlighted on the Discoveries Featured of the VICB communications. [2013-04] Qi’s paper Integrative omics analysis reveals the importance and scope of translational repression in microRNA-mediated regulation has been published in Molecular & Cellular Proteomics. Through integrative analysis of miRNA, mRNA and protein expression data in nine colon cancer cell lines, we found that translational repression was involved in 58% and played a major role in 30% of all predicted miRNA-targeted interactions. Moreover, sequence features known to drive site efficacy in mRNA decay were generally not applicable to translational repression. Congratulations, Qi! [2013-02] Dr. Qi Liu has been promoted to Research Assistant Professor of Biomedical Informatics effective February 1, 2013. Congratulations, Qi! [2013-01] Jerome’s paper GLAD4U: deriving and prioritizing gene lists from PubMed literature has been published in BMC Genomics. Congratulations! [2012-08] DBMI student Abigail Lind will be doing a research rotation in our group during the Fall semester. Welcome! [2012-08] Mingguang’s paper a network-based gene expression signature informs prognosis and treatment for colorectal cancer patients has been published in PLoS One. Congratulations! [2012-07] Derek Shyr, a rising sophomore at the Washington University in St. Louis joined the group for a summer internship. Welcome, Derek! [2012-06] Amber Shindhelm, a rising senior majoring in Mathematics and Computer Science at Vanderbilt joined the group for a summer internship. Welcome, Amber! [2011-11] Xiaojing’s paper Protein identification using customized protein sequence databases derived from RNA-Seq data has been published in Journal of Proteome Research. Congratulations! [2011-10] GLAD4U was one of the Show Off Your Apps Winners in the NLM’s first software development challenge on the Innovative Uses of NLM Information. [2011-09] Mr. Jing Wang joined the group as a Bioinformatics Systems Engineer. Jing has a Master’s Degree in Bioinformatics from the Harbin Medical University in China. Welcome to the group! [2011-09] Mingguang’s paper Semi-supervised learning improves gene expression-based prediction of cancer recurrence has been published in Bioinformatics. Congratulations! [2011-06] Our paper Relating protein adduction to gene expression changes: a systems approach is featured on the cover of the July issue of the Molecular Biosystems. It is also highlighted in Vanderbilt’s Reporter and evaluated by the Faculty of 1000 (F1000). As stated in the F1000 evaluation, “These researchers used powerful systems biology strategies to uncover mechanisms linking adduction of individual proteins by 4-hydroxynonenal to global changes in gene expression that accompany cellular exposure to this noxious lipid-derived electrophile. …… This paper highlights the capability of integrative approaches to generate new hypotheses to explain the pathogenesis of diseases that involve toxic electrophiles”. A pdf file of the paper with the Molecular Biosystems cover can be downloaded here. [2011-06] Dr. Qi Liu joined the group as a visiting scholar. Dr. Liu is an Associate Professor of Bioinformatics at the Shanghai Jiaotong University in China. Welcome to the group! [2011-06] Mindy is coming back to intern with us this summer, welcome back! [2011-05] A research paper Relating protein adduction to gene expression changes: a systems approach has been published in Molecular Biosystems. The software Netwalker described in the paper can be downloaded from http://bioinfo.vanderbilt.edu/netwalker. [2011-05] A software paper Fast network centrality analysis using GPUs has been published in BMC Bioinformatics. Source code for the GPU-based centrality computation algorithm described in the paper can be downloaded from http://bioinfo.vanderbilt.edu/gpu-fan. [2011-05] Xiaojing received the Second Prize for her poster “Integrating RNA-Seq data improves protein identification in shotgun proteomics” presented at the 2011 VICC Systems Biology Retreat. Congratulations! [2011-03] Jing’s paper A bioinformatics workflow for variant peptide detection in shotgun proteomics has been published in Molecular & Cellular Proteomics. Congratulations! [2011-01] DBMI student Dong Wang will be rotating with our group for the Spring semester. Welcome! [2010-11] Dr. Zhang received the High Impact Research Award from the Vanderbilt-Ingram Cancer Center for the work published in Molecular Systems Biology in 2009. [2010-09] Dr. Jing Zhu joined the group as a Postdoctoral Research Fellow. Dr. Zhu just got her PhD in Bioinformatics from the University of Electronic Science and Technology of China. Welcome to the group! [2010-06] Mindy Hong from the Emory University will be doing a summer intern in our group. Welcome! [2010-05] Our paper Co-expression module analysis reveals biological processes, genomic gain, and regulatory mechanisms associated with breast cancer progression has been published inBMC Systems Biology. Source code for the module identification algorithm described in the paper can be downloaded from http://bioinfo.vanderbilt.edu/ice. [2010-04] Jing has completed her postdoctoral training and has taken an Associate Professor position in the Shanghai Jiaotong University in China. Congratulations and all the best for the future endeavors! [2010-04] CanProVar was highlighted in the NCI’s eProtein Newsletter and Vanderbilt’s Reporter. [2010-04] Dr. Xiaojing Wang joined the group as a Postdoctoral Research Fellow. Dr. Wang got her PhD in Bioinformatics from the Shanghai Institutes for Biological Sciences, Chinese Academy of Sciences last summer. Welcome to the group! [2010-03] Congratulations to Jerome on passing his Master’s thesis defense! [2010-01] Dr. Mingguang Shi joined the group as a Postdoctoral Research Fellow. Dr. Shi got his PhD in Pattern Recognition and Artificial Intelligence from the University of Science and Technology of China last summer. Welcome to the group! [2010-01] Jing’s paper CanProvar: a human cancer proteome variation database has been published in Human Mutation. Congratulations! [2009-08] Jing’s paper Network-assisted protein identification and data interpretation in shotgun proteomics has been published in Molecular Systems Biology. Congratulations! [2009-08] Naresh Prodduturi joined the group as a Bioinformatics Systems Engineer. [2009-08] Bing Zhang was awarded an NIH grant from the National Institute of General Medical Sciences in support of the research project entitled “Systems Approach to the Biological Basis of Colon Cancer Metastases”. [2009-06] Ruke Achoja from the Meharry Medical College will be doing a summer intern in our group. [2009-05]Naresh Prodduturi, a new graduate from the bioinformatics MS program at the University of Texas at El Paso will be doing a summer intern in our group. [2009-04] Dr. Zhang was awarded a pilot grant from the Silvio O. Conte Neuroscience Research Center, Vanderbilt University for a project entitled “Integrative Systems Biology Approaches to Elucidate Serotonin Network Modules and Their Regulators”. [2008-08] DBMI student Cathy Derow will be rotating with our group for the Fall semester. [2008-07] DBMI student Jerome Jourquin joined the group as a graduate student. [2008-02] A research paper From pull-down data to protein interaction networks and complexes with biological relevance has been published in Bioinformatics. [2008-01] DBMI students Jerome Jourquin and Peter Straub will be rotating with our group for the Spring semester. [2007-11] The paper Proteomic parsimony through bipartite graph analysis improves accuracy and transparency was highlighted in the Reporter. [2007-08] A research paper Proteomic parsimony through bipartite graph analysis improves accuracy and transparency has been published in Journal of Proteome Research. [2007-04] Dr. Jing Li joined the group as a Postdoctoral Research Fellow. [2007-04] Dr. Zhang was awarded a pilot grant from the Center in Molecular Toxicology, Vanderbilt University for a project entitled “Computational prediction of protein adduction mediated transcriptional regulation”. [2006-10] A research paper Detecting differential and correlated protein expression in label-Free shotgun proteomics has been published in Journal of Proteome Research. [2006-06]Dr. Zhang joined the Department of Biomedical Informatics, Vanderbilt University.